St. Clare was born in Assisi, Italy and was the eldest daughter. She was always devoted to prayer as a child. When she turned fifteen her parents wanted her to marry a young and wealthy man but she wanted to wait until she was 18. When she reached 18, she had heard of Francis’s preachings, which were beginning to change her life. He told her she was a chosen soul from God. One night she ran away to go and follow Francis. Francis dressed her in a black tunic and a thick black veil. Clare was put in with the Benedictine nuns near Bastia. She was almost pulled by her father since he wanted her to marry, but he agreed to let her stay. Clare and her sister Agnes soon moved to the Church of San Damiano, which Francis himself had rebuilt. Other women joined them there, and it soon became known as the place of the “Poor Ladies”. San Damiano became the focal point for Clare’s new religious order, which was known in her lifetime as the “Order of San Damiano”. It emerged as the most important house in the order, and Clare became its undisputed leader. By 1263, just ten years after Clare’s death, the order became known as the Order of Saint Clare. Unlike the Franciscan Friars, whose members moved around the country to preach, St. Clare’s sisters lived in enclosure, since any other life was hardly conceivable at this time for religious women. Their life consisted of manual labor and prayer. For a short period of time, Francis himself directed the order. In 1216, Clare accepted the role of Abbess of San Damiano. Clare defended her Order from the attempts of prelates to impose a rule on them that more closely resembled the Rule of St. Benedict, rather than Francis’s stricter vows. Clare sought to imitate Francis’ virtues and way of life so much so, that she was sometimes titled “another Francis”. She also played a significant role in encouraging and aiding Francis, whom she saw as a spiritual father figure, and she took care of him during his illnesses at the end of his life, until he died in 1226. After Francis’s death, Clare continued to promote the growth of her Order, writing letters to abbesses in other parts of Europe and keeping close watch over her order as every Pope attempted to impose a Rule on her, that watered down their commitment to poverty. On August 9, 1253, Pope Innocent IV confirmed that Clare’s Rule would serve as the governing rule for Clare’s Order of Poor Ladies. Two days later on August 11, Clare died at the age of 59. Her remains were interred at the chapel of San Giorgio. 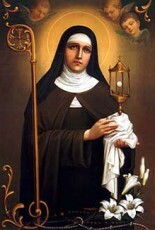 On August 15, 1255 Pope Alexander IV canonized Clare as Saint Clare of Assiss. Construction of the Basiclica of Saint Clare was completed in 1260, and St. Clare’s remains were transferred to the new basilica where she was buried beneath the high altar. Some 600 years later in 1872, St. Clare’s remains were tranferred to a newly constructed shrine in the crypt of the Basilica of Saint Clare, where they can still be seen today. Pope Pius XII designated her as the patron saint of television in 1958, on the basis that when St. Clare was too ill to attend Mass, she had reportedly been able to see and hear it on the wall of her room. The Eternal Word Television Network (EWTN) was founded by a Poor Clare Nun – Mother Angelica, the largest Catholic network in the world. St. Clare was raised spiritualy with the guidance of St. Francis. She was to marry at an early age, but was able to hold off until she was 18, then was old enough to run off and follow her passion for a religious life. She not only followed St. Francis, but she founded her own order that was accepted by Rome, with a Rule very similar to that of St. Francis. She spent her life in service to the Church, in building up an order of cloistered Nuns that would be a blessing to the Church even today, 7 centuries after her death. Vocations to the Order of Poor Clare is alive and well today, in the 21st century.